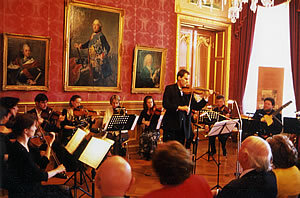 The Kottmann School has produced two chamber orchestras: the Collegium Instrumentale Alois Kottmann, founded in 1968, and the "Kottmann Streicher" (Kottmann Strings) which are now in their fifteenth year. This chamber orchestra was originally established to promote and foster ensemble-playing as part of a violin conservatory education. After taking their final examinations the members stayed together to form an orchestra with its own characteristic string-sound. The venture proved successful. Under their leader, the violinist Boris Kottmann (Internet: www.boris-kottmann.de), the Kottmann Strings have performed in the Frankfurt Alte Oper, at the Bad Homburg "Schloss" concerts, at the Flörsheim Gallus concerts, in the Frankfurt Paulskirche, at the Hessian Horticultural Show at Schloss Phillipsruhe in Hanau and at numerous concerts at the Kreishaus in Hofheim am Taunus. The "Kottmann Streicher" give major new talents the opportunity to play with an orchestra in front of an audience at the "Internationale Musiktage Main-Taunus-Hofheim". CD productions and further concerts are planned in the region in the future. Besides success collaborations with soloists such as Martin Lücker, David Tasa, Hildegard Heichele and Liviu Varcol, the strong links to the "Solo-Bläsern Rhein-Main" represent a further special relationship. These musicians from established ensembles extend their musical possibilities by joining forces with the finely shaded and homogenous sound of the strings to form a single musical and spiritual unit.